Last Saturday, the nation gathered as one to watch what is expected to be the final concert for Gord Downie and The Tragically Hip. Millions watched as Gord courageously took the stage, bedazzled and full of energy, a surprisingly upbeat performance for someone battling terminal brain cancer. 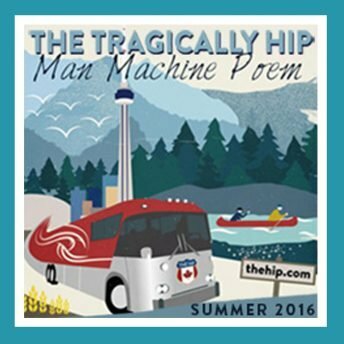 But that has always been a big part of why Canada loves The Tragically Hip and why their frontman continuously embodies the band's name. He wears his heart and his style on his sleeve and while the country is celebrating him, he is doing his best to celebrate Canada in return. Collaborating with three Canadian designers to create his show stopping stage looks, we love that Gord embraced his roots and these local designers. His first collaboration is close to our hearts as she is a friend on the show circuit and we are so happy for milliner Karyn Gingrass of Lilliput Hats. Inspired by Bob Dylan, each of Gord's hats were custom made, adorned with beautiful feathers and the finest fabrics. True showstoppers, these hats definitely defined his style for the tour. Next, Gord worked with Canadian designer Izzy Camilleri to design custom suits in vibrant hues to go with each one of his hats. Made of bright metallic leather, he wore bold creations in hot pink, turquoise, silver, and gold and was shining bright in each one. When he swapped out his typical jeans and t-shirt wardrobe for these colourful creations, it was clear that Gord Downie wanted to make his last hoorah fun and exciting. From head to toe Canadian style, the finishing touches were on his custom ankle boots, complete with the lyrics from "Ahead by a century" lasered into the leather soles. Created by Toronto-based footwear company Jitterbug Boy, these were an amazing detail and a great way to complete his outfits. This band will always hold such a special place in our hearts and we love that Gord appreciates Canadian made style like we do. Lousje took Bean and her brother to their very first Hip concert in 1991 at the Molson Amphitheatre in Toronto. From that first taste the band has been part of our playlists for the last 25 years and Bean was sure to catch one of the very last shows on this sold out tour. We have been so lucky to have been blessed by Gord Downie and the music of The Tragically Hip, his zest for life, his shakespearean lyrics, and his love for Canada and our designers. You truly are Ahead by a Century Gord, and we thank you for all the joy and memories we have lived through your lyrics.